On wednesday the 410 Morris sticks were installed in the meadowed area. We tried to do as little damage as possible to the grasses. By the start of the exhibition it is hoped the grasses will be as high as the sticks. Judging by the feedback from the passing public the sculptures are going to be well received. Thanks to Pippa and Mich for their help! 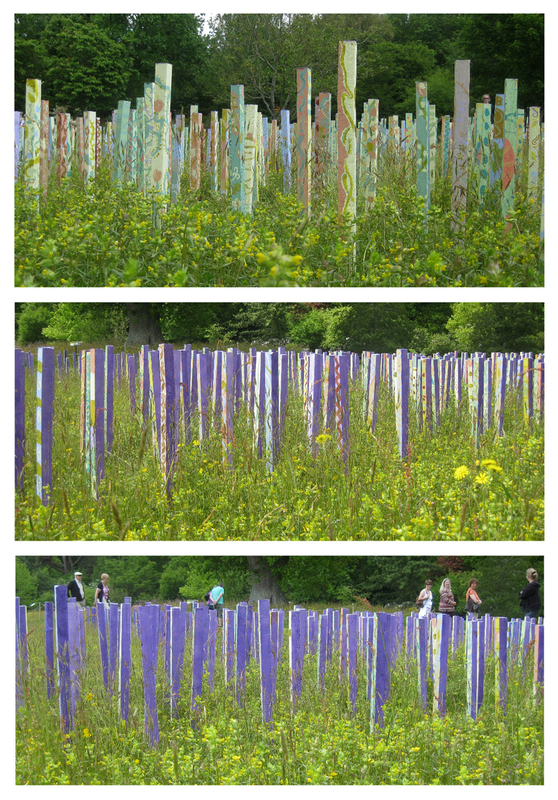 This blog documents the lead up to 'Through', a solo exhibition of paintings at The Plough Arts Centre, Torrington, Devon in July 2010 and 'Through The Garden', a large scale sculptural project at RHS Gardens, Rosemoor working with young people from across North Devon. The sculptures take their inspiration from the landscape, my work and from William Morris, whose designs will also be shown at RHS Rosemoor.